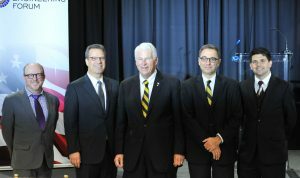 (Pictured from left): Chad Evans, Council on Competitiveness; Jeff Wilcox, Lockheed Martin, John Hitt, UCF; Michael Georgiopoulos, UCF and Albert Manero, Limbitless Solutions. 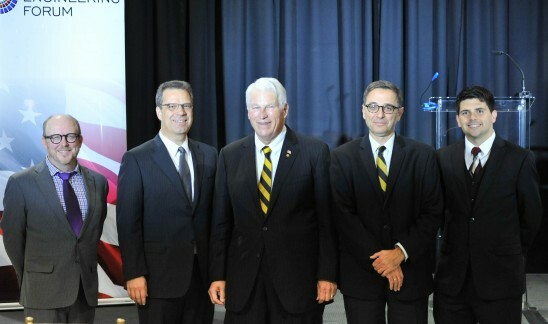 UCF President John Hitt furthered the university’s reputation as a leading institution for engineering and computer science at the National Engineering Forum (NEF) regional dialogue on campus last month. Directing Pell Grant and student loan support toward engineering studies. Recruiting future engineers from underrepresented groups and regions – and start STEM engagement before high school. Align university curriculum to multi- and transdisciplinary opportunities, and focus state and federal funding efforts and peer review to reward/provide grants to multi-disciplinary initiatives. Connect industry and universities to initiate “junior design projects” and develop more relevant senior design projects that map to the real world. A complete synopsis of the dialogue is available here, as well as a slideshow of photos from the evening here. As host of NEF’s 17th regional dialogue, President Hitt said UCF’s “roots” in engineering date to 1963 when “state leaders envisioned an institution that would educate students for promising space-age careers in engineering, electronics, and other technological professions.” UCF’s scope has broadened through the years and the College of Engineering and Computer Science (CECS) is the largest of its kind in Florida and 9th largest in the nation, serving more than 9,500 graduate and undergraduate students. To learn more about the National Engineering Forum, visit www.nationalengineeringforum.com, follow on Twitter @NatlEngForum, Facebook at NEFGen and Instagram at NEF Generation.